Somali troops backed by Ethiopian forces are fighting about 600 Islamist militiamen in the south of the country, says an interim government spokesman. Abdirahman Dinari told the BBC soldiers had surrounded the militia group near the Kenyan border - which has been reinforced to stop their escape. 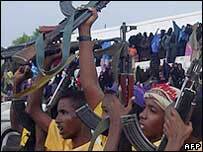 US naval forces are deployed off the Somali coast to prevent leaders of the Union of Islamic Courts (UIC) escaping. The UIC controlled much of Somalia until retreating over the past 10 days. Kenya's government has shut its border with Somalia, despite criticism from the United Nations' refugee agency. Foreign Minister Raphael Tuju said he believed that combatants were sending their families into Kenya posing as refugees and therefore the country had every right to defend its borders. Meanwhile, talks are continuing across the region to try to secure an African Union peacekeeping force for Somalia. Ugandan President Yoweri Museveni and US Assistant Secretary of State for African Affairs Jendayi Frazer have been in Ethiopia meeting Prime Minister Meles Zenawi. Ms Frazer is expected for high level discussions with African leaders and other international representatives in Nairobi on Friday. Interim Interior Minister Hussein Aideed claims there are some 3,500 Islamist fighters still hiding in the capital, warning they are "likely to destabilise the security of the city"
Three people have been seriously injured in a rocket attack on a truck in Mogadishu. Interim Prime Minister Ali Mohammed Ghedi is reported to have said forcible disarmament will begin in Mogadishu at the weekend. Few residents have responded to a call to disarm and the demand for AK-47 rifles, hand grenades and land mines has risen. In a city of two million people, there are an estimated one million weapons. The BBC's Mohammed Olad Hassan in the capital says although calm has returned, tension is high and people fear anarchy may return to Mogadishu. 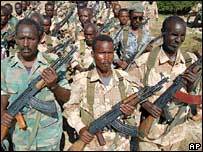 Ethiopia sent heavily armed troops into Somalia to back up forces loyal to the transitional government after accusing the UIC of having links with al-Qaeda. They swept the Islamist militias from areas they had controlled for six months, but the Islamists said their retreat was tactical and threatened to launch an insurgency. Ethiopia's prime minister has made it clear he wants to withdraw his troops within the next few weeks. The Ethiopians want international peacekeepers to be deployed to prevent a vacuum which would allow the re-emergence of former warlords who controlled the country since 1991. Uganda has offered to commit 1,000 troops to a 8,000-strong regional peace force. Mr Museveni says he has troops trained and ready for this role, once his country's parliament gives its approval. The AU commissioner for peace and security said he hoped other African countries would follow suit. "I still hope that key AU members will be glad to associate their name and the name of their country in what I believe is the most important peace undertaking in the recent history of Africa," Said Djinnit told the BBC's Network Africa programme.